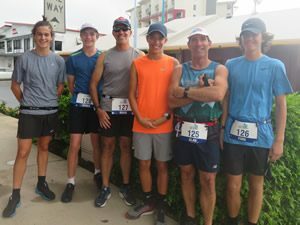 Meanwhile, the Martel Marina Sprint 5 & 10km event named after one of the Mackay Road Runners Club’s legendary runners and Life Member, Charlie Martel, was an enjoyable social run where runners could choose an option to suit their current ability and fitness level. 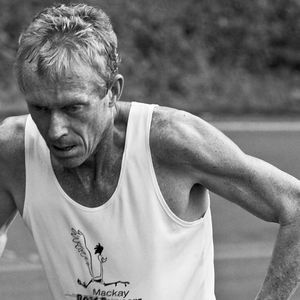 Many thanks to Andrew Short, Peter Wright and Paul Tilse for assisting in setting up and race day voluntary duties that is so much an integral part of the Mackay Road Runners weekly events…..so much appreciated! Julian Picot easily completed the 10km event after notching up another easy 20km training run on the same morning. Julian lead a quality field of runners including Carl Pinkstone, George Hannaford, Hunter McGovern, Ashlee Scott, Ricky Parker, Kylie Harbour, Tim Caddy, Simba Walz, Scott McIntosh and Calvin Franklin. Despite rain free conditions throughout the event, the Breakwater course held several slippery and technical areas where runners had to be mindful of many obstacles whilst the Breakwater wall is being repaired. Runners were very aware of this and held excellent regard for their fellow runners and general public users in the same vicinity. Congratulations to new runners of all abilities being involved and enjoying their fitness activities with like-minded individuals whilst pursuing their own goals. Excellent performances came from Veteran talents Stuart Sprott, Ricky Parker, Judy Zahn, Cilla Martland, Jan Smith and Carol Brown as well as their younger competitors, Mark Pashalis, Alan Zamparutti, Mark Walz, Karla Hook, Carmel Mahon, Carolyn Steginga, Craig McGahey, Jo Skinner, Jo Ashgrove, Sarah Jensen, Charlie Bone, Peter Ellison, Peter Ford, Jose Short, Ross Connor, Andrew Short, Shane Barben, Simon Henderson, Belinda Van Lint and Ainslie Heinke. 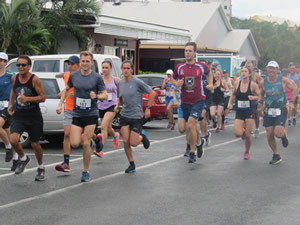 Runners are now looking forward to this weekend’s social 5km BMA Mackay Marina Twilight 5km run/walk as well as the first Club Championship race of the year, the annual iconic Queens Park 5km. Runners who wish to be included in handicap and club championship points need to register online to become a Member on or before the 28th February. Members will then be issued with their own individual timing chip and race number which must be worn at every handicap points/scratch start/club championship race to register your time with the timekeepers. Runners must also register on race day at least fifteen minutes before race start with the Registrar and the timekeeper. All volunteers need to pack up ten minutes prior to the race so that they can also participate in the event…consideration of this must be adhered to all times. Runners and volunteers are welcome to stay after the 5km Club Championship race for lucky random draw prizes donated by the Mackay Road Runners Club. Members are also reminded that the Club holds monthly committee meetings to which all are warmly invited. They are held on the second Monday of each month at 5.30pm at the Techserve office in Tennyson Street, Mackay. All comments are duly noted and up for consideration by the meeting. The Club welcomes input for discussion and will be passed by obligatory majority of votes. Please contact the Committee if you would like to pass on comments if unable to attend. The Club also welcomes two new Secretaries, Julian Picot and Ashlee Scott to assist in the vital running of the Club….thank you to Julian and Ashlee as well as the 2018 incoming Committee of Tim Magoffin, Shawn Claydon, Paul Tilse, Andrew Short, Jose Short and Janelle Tilse. Thank you also for the return of regular volunteers who are but not limited to Tim Caddy, Lindsey Wiggins, Brendan Bishop, Judy Zahn, Peter Wright, Sandra Henderson, Jim Ford, Alana Ford and Derek Woods. All current and any new volunteers gratefully accepted.